I know, I know, a preschool rocks theme can bring visions of rocks being thrown and boo-boos. Let's teach our kids to be more curious--beyond the throwing! Let's investigate them! Let the Preschool Rocks Theme planning begin! Use rocks as you would for marble painting! Place paper in a shallow box cover or tray. Plop on a few colors of watered down paint. Shake the box left to right and and in circles. This is a two part project! Spray the pans with Pam or other cooking spray. Fill with the dough and let dry (takes about 3 days or so). The children then paint as they like. When dry, make an obstacle course with them to follow! Crayon Melt Rocks Thanks, Kimberly, for this idea! Collect large rocks place them in the sun to warm up then use crayons to color with. The crayons will melt as they use them from the rock being warm. Pet Rock Thanks again, Kimberly, for this idea! Have the children collect a rock for a pet. Have them paint, color it with markers, stickers and give them googly eyes. Have them name it! Add a bucket of rocks and stones for the children to build with. They can make roads, walls, animal pens...they have a lot of ideas! 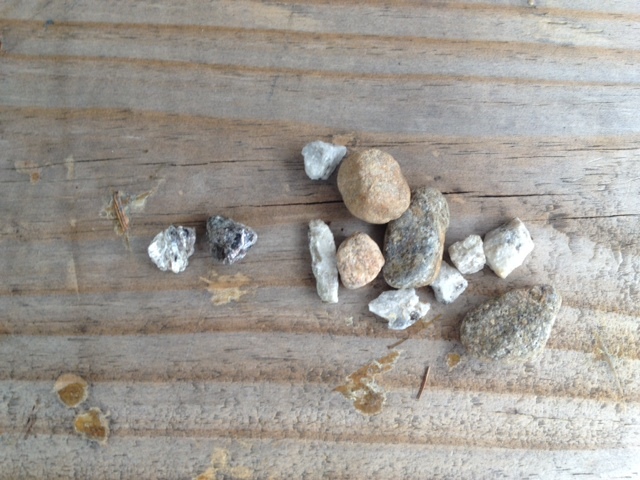 Bring a wide variety of rocks to circle..large, small, colored, geodes, etc. Discuss rocks and write down their description. Then make a group rock! In advance, have all the materials to make plaster of paris in a shallow round bin. Have the children each choose one rock from the collection after your discussion. Mix the ingredients as directed on the package of plaster of paris. Each child presses their rock into the mixture. Remember the song "The magic ball, goes round and round, so catch it quickly..."
Play this game while passing a rock. The person who is holding the rock at the end is not out (preschoolers are too young for this type of "competition"), but needs to say one thing about the rock such as the color, size, weight, etc. Read the story to the children and then make your own soup! Provide tables, trays, cash register, bags and other items. I know, I know! But set the rules! They are ONLY to throw into the bins and of course, this must be supervised so children don't walk in front of the "tossers"! Provide bins, laundry baskets, boxes, etc. for the children to toss the rocks into. I saw someone once cover the rocks with the toes of socks! Pretty cool! Draw a hopscotch and use rocks! Preschool Rocks Theme Activities to help your Preschoolers develop those small muscles in their hands! Place the stones in a bowl. The child shakes the bowl to mix the stones around (shake it up and down) and when done, they count how many "dinosaur" or "shape" rocks are facing up. to get your Preschoolers Movin' and Groovin'! Thanks Kim, for this idea! Preschool Rocks Theme Activities for the Senses! Add pea gravel to your sand table. Add sticks, sifters, cups, small toy cars, dump trucks, etc. Children can "draw" roads or other designs on the gravel. Add a few colored rocks to the pea gravel above for a rock hunt! for your Preschool Scientists in Training! Obviously, this is a highly supervised activity! The children cover the rocks with cloth (to avoid rocks flying at others!) and hit with the tools. When done, check out the insides with magnifying glasses! Writing Activity Ideas for Your Preschool Rocks Theme! The children spell out their names or other words!